Obsessed much! Has the world gone coconut mad or is it just me? I cannot get enough of the fuzzy little fellas. Whether its drinking, eating, cooking with it or rubbing it on my skin. I am officially obsessed. I knew the health benefits from using coconut oil were endless, but what I didn't know until recently, was how it can help to whiten teeth naturally. 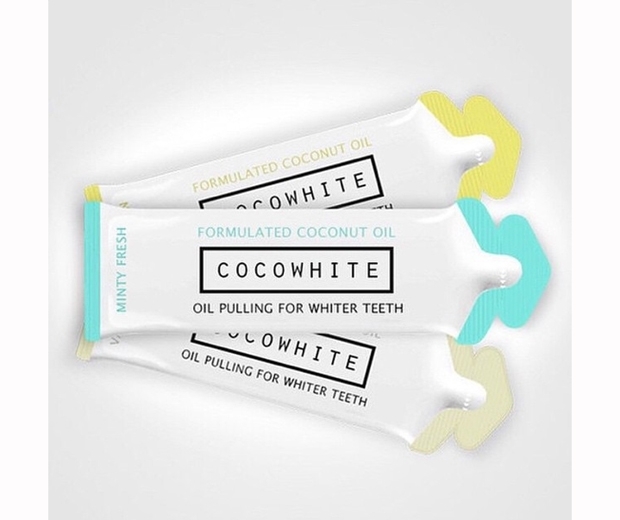 I'm intrigued by the hype surrounding Cocowhite and their take on the ancient tradition of oil pulling, so much so I simply have to have a go. The main benefit of oil pulling is to reduce the amount of harmful bacteria in the mouth. Bacteria in the mouth creates a biofilm on the teeth - a thin layer that it uses to adhere to the surface. This is what we know as plaque. Having some plaque on your teeth is normal, but if it gets out ofhand it can cause all sorts of problems, including bad breath, yellow teeth, gum inflammation, gingivitis and cavities. The way oil pulling works is simple. When you swish the oil around your mouth, the bacteria 'get stuck' in it and dissolve in the liquid oil. As an ex-smoker I'm always on the look out for affordable and safe ways to brighten up my smile so I'm up for giving this a go. Who wouldn't want their mouth cleansed from harmful bacteria and to get some life back in those pearly whites? All ingredients are 100% natural and preservative free - no hidden nasties - bonus! It's a 14 day process and my order is in! I'll post again soon with the results.